Pamir Highway or «Pamirsky Trakt» in Russian is a section of M41 road going from Bishkek (Kyrgyzstan) to Termez (Uzbekistan) crossing Tajikistan thru the Pamir mountains. Some sources claim it finishes at Afghan Mazar-i-Sharif though there is no information whether Termez — Mazar-i-Sharif road is a part of M41. The Pamir Highway is usually referred to a section between Tajikistan city Khorog located in Gorno Badakhashan and Kyrgyzstan’s south capital Osh. The section between Dushanbe and Murghab is also has European number E008. The road was built between 1931-1934 by Soviet engineers to connect Gorno Badakhshan and Pamirs with the rest of Soviet empire. Basically the road is used since time immemorial and say used to be a section of ancient Silk Road where caravans loaded with rubies extracted in the mountains around Rang Kul lake. The pack road between Dushanbe and Khorog was built in 1915 by decree of tsarist government. Same year a few punished field engineers were sent to resolve the issue and redeem their fault for participation in Tashkent disorders of 1912. The tough punishment made it none of them survived exploding vertical walls of Pyanj canyon and so the only monument left behind was a road. But it wasn’t a road as we now get used to understand it, but kind of 1 meter wide trail suitable only for packed animals or people. The motor way was built much later by Soviet engineers exploding granite walls, breaking thru the rocks and by building the bridges over the Pyanj side feeders. It was also complicated as the road could only go by the right side of Pyanj river as the left one belong to Afghanistan. 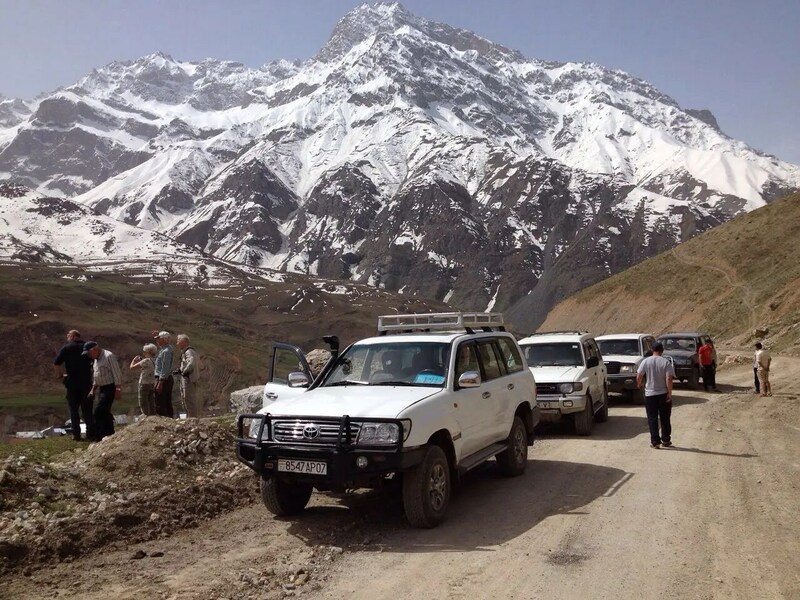 Despite it all the road was finally completed and still remains the only road connecting Tajikistan with Gorno Badakhshan. These days most of the highway’s pavement is damaged by frequent land slides, avalanches, water floods and Chinese trucks making their way from Kashgar to Dushanbe over Qolma pass. Pamir Highway is the second-highest paved road in the world with its highest point at Ak Baital pass 4,655 m. The section between Khorog and Sary Tash lies at the altitude of 4000 metres above sea level.